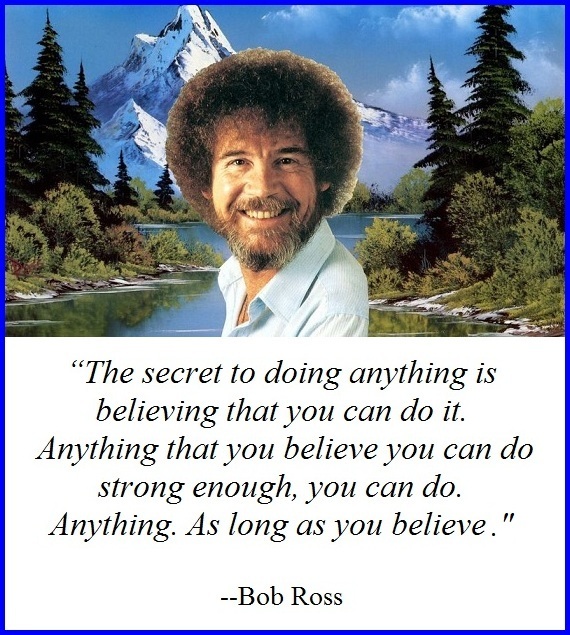 This week’s words of inspiration are from the late Bob Ross--artist, teacher and PBS host--who instilled in generations not only a passion for painting but also a love for nature. He looked outside and was in awe of God’s majesty. His artworks were filled with “happy little clouds” and “happy little trees." Bob was also an animal lover. As a child growing up in Florida, he once nursed a wounded alligator back to health in the family's bathtub. Throughout his life, he maintained his soft spot for animals; his Florida home usually housed any number of critters that Ross was trying to help rehabilitate. At various times he played host to birds with broken wings, orphaned baby squirrels, and an epileptic squirrel that lived in his empty Jacuzzi. Ross liked animals so much that he would tape squirrels in his backyard. During the early 1990s, shortly before his untimely death of lymphoma, Ross had hoped to develop a new non-painting show that would introduce children to a variety of new wildlife. Happy Birthday in Heaven, Bob! Your legacy lives on . . .